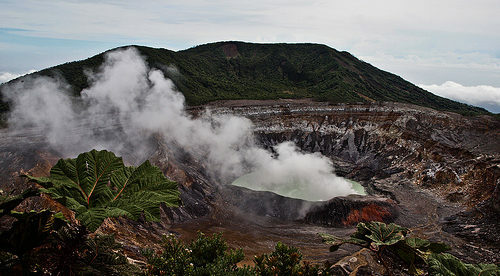 Living in Alajuela, Costa Rica means you can visit the nearby Poas Volcano. Alajuela, just 13 miles or so from Costa Rica’s capital, San José, is in many ways the country’s second city. It is second in size, with a population of 50,000. And it is also the home to La Liga, one half a bitter soccer (here known as futbol) rivalry with San José’s team, Saprissa. The country’s main international airport is in Alajuela. And it’s the birthplace of national hero Juan Santamaria, who died in battle against William Walker, an American mercenary who invaded Costa Rica. Alajuela is steeped in history and tradition in other ways. It was a former capital of the country. The town comes together each year to celebrate Juan Santamaria Day on April 11. It’s a national holiday but is celebrated most in his hometown. It’s also known as the City of Mangos, thanks to the many mango trees in the central park in front of the large red-domed cathedral downtown. If you’re in town in July, be sure to check out the mango festival. Living in Alajuela, Costa Rica is also popular with expats due to its climate and convenience. Squarely in the Central Valley region, the weather is perfect year-round, averaging in the mid-70s. There is also top-notch shopping at the local AutoMercado, Walmart and PriceSmart, a warehouse membership shopping club. All three have imported items from the U.S. And just down the Pan-American Highway (known locally as the InterAmericana), you’ll find San José and its suburbs, home to the best public and private medical care in the country. The nearby Poas volcano, whose slopes begin just outside of city limits, is a great place to visit. And half the fun is the drive up to the crater, which you can actually look down into. The altitude, nearly 9,000 feet, means the weather is nice and cool. And you get a great view of the entire Central Valley. Be sure to pick up fresh strawberries from the farms that dot the hillside on your way down. Those living in Alajuela, Costa Rica will also note it has a lively downtown with great shopping and a great central market, where fresh fruits and vegetables, fish, meat, chicken, herbs, and flowers, as well as household goods, clothing, and more can be had for bargain prices. The market takes up an entire city block. An expat hang out is the Tex Mex place, called Jalapenos, just a few blocks to the west from the cathedral. Here you’ll get the inside scoop on local real estate, the best doctors, and other services. The expats in Alajuela tend to live outside the center, in the rural areas with mountain views surrounding the city.